My New York Fashion Week coverage continues with the rewardStyle party at La Sirena! For those of you who don’t know what rewardStyle is, it’s a fabulous company that many bloggers work with. Every September they throw a big party at New York Fashion Week. Last year it was on a Monday and I had to miss it, so I was super excited to find out it was on Saturday this year and I could be there! It never ceases to amaze me how genuinely sweet all the bloggers are to each other … or at least to me! I was so happy to get to meet Amy Ann of Straight A Style in person. We’ve been following each other for years and she is a delight! Jamie of More Than Turquoise is a total goofball like me and we had so much fun together. Cathy of The Middle Page couldn’t have been sweeter, as well as Sheree of She She Show, Shawna of Chic Over 50, Hollie of Fashions of Fancy, Tiffany of Street Style Squad, and Heather of So Heather. And if you’ve been following me awhile, you might remember that for The Fierce 50 campaign that I was paired with Debbie of Fashinomics. After interviewing each other for a blog post, it was wonderful to finally get to meet her in person. My only complaint is that it was all a bit overwhelming … and with so much going on, the music blaring, and so much excitement and so many people to meet … !! I kept forgetting to take photos …. ME, for goodness sake … argh! And I didn’t even know until after the party that Louise Roe and Amber Venz Box were there! One fun feature of the party was this 360 degree photo booth! Check these out! Who do you recognize?! Don’t forget to link up, Ladies! And remember you don’t have to be a blogger to link up, you can share your outfit posts from Instagram! Did you catch my first two NYFW posts? Here’s my plane-t0-runway outfit and my Friday night. Let me know in the comments what kind of NYFW coverage you’d like from me! What an incredible time to be able to meet these women, Dawn!! One day I hope to meet you too! Looks like a fantastic event Dawn! I love Fashion week! So flipping cool!!! Next to you, Amy Ann would be my favorite to meet! It certainly looks like your having a great time and what a wonderful experience. Thanks for sharing some of the highlights and for the link up. How fun! Looking wonderful as always! I love reading your recaps! Looks like a great party! I always have so much fun when I meet up with other bloggers that I forget to take photos too! How fun! I love the 360 photo booth and you looked amazing! Looks like you are having a blast! I sure did, Pam … thanks! You look fabulous and I love hearing about NYFW! How fun! What a fun party and so cool that you got to meet some fellow bloggers. Thanks for the link up and for sharing! It was so fun! Thanks, Kathrine! Looks like you had tons of fun, Dawn. Thanks for the link up! I sure did, Pam. Thanks! What a great time! 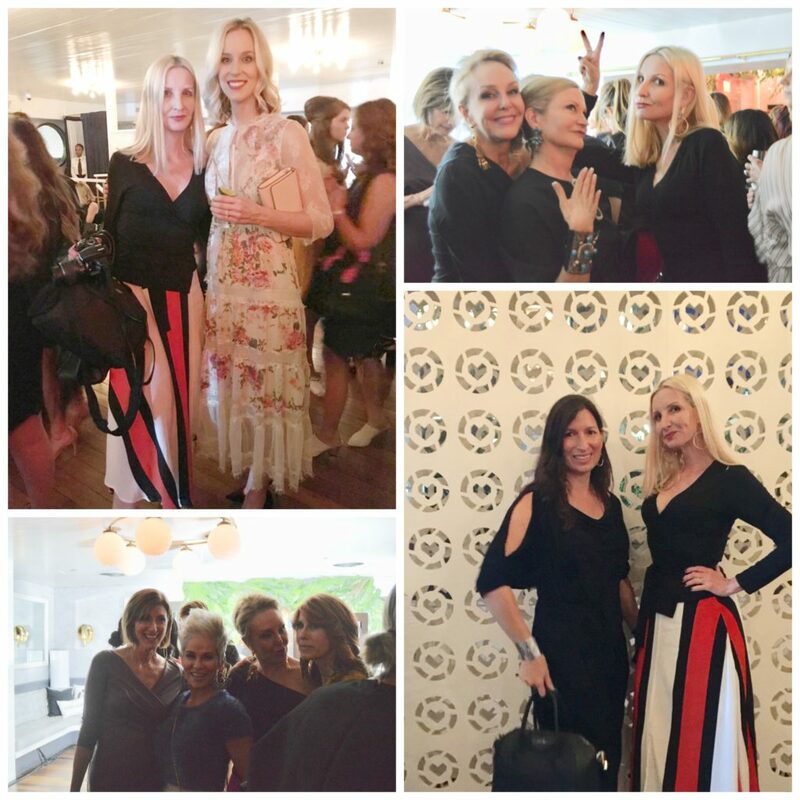 Everyone looks fabulous and so glamorous – what fun! It was so fun! Thanks, Kellyann! I only recognized 3 faces, but it looks like you had fun! Looks like you had a great time! I remember how much fun i had at nyfw 2 yrs ago! Thanks, Jess! I still remember that beautiful Tadashi dress you wore! Soooo fun to meet you! The best outfit ever too!! Aww … no yours was the bestest! Ahh so fun! I would probably go to NYFW just for this party! So cool you got to meet some of my favorite bloggers! You are the sweetest, Monika. Can’t wait to meet you in person some day … hopefully soon! How wonderful to meet up there and have fun. Can I say my favourite is the 360 degree booth. I’d go wild in there. We have London FW now. I’m not important enough to be invited.